Mike Greene - mgreene@shawmedia.com John Hadley, Director of Facilities Management for McHenry County, stands next to one of the green initiative his department has implemented Thursday, April 26, 2012 in Woodstock. The green touch screen allows users to monitor the building's energy efficiency and how much energy is being generated by solar panels on the buildings roof. 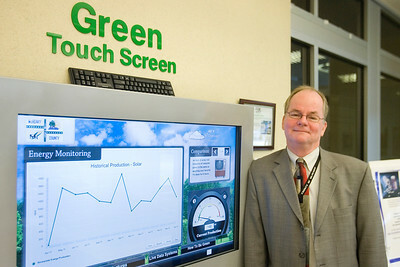 John Hadley, Director of Facilities Management for McHenry County, stands next to one of the green initiative his department has implemented Thursday, April 26, 2012 in Woodstock. 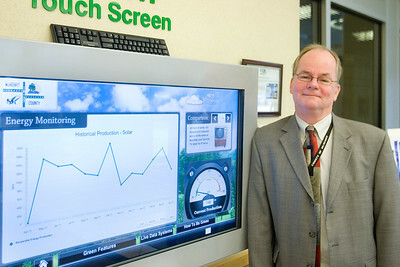 The green touch screen allows users to monitor the building's energy efficiency and how much energy is being generated by solar panels on the buildings roof.